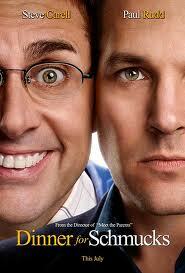 When the first trailer for “Dinner for Schmucks” popped up in theaters, I thought the premise was ridiculous. A guy can only get promoted if he brings the biggest idiot to a secret corporate dinner? I mean, seriously — what were they smoking at the pitch for that movie? But then, they assembled a dream cast. Paul Ruud. Steve Carell. Zach Galifianakis. And the clips look pretty hilarious. But before I go to the movie this weekend, at least one of the morning or late night talk hosts promoting the film this week has to get the name right. It’s “Dinner for Schmucks.” Not Smucks. Or Shucks. Or whatever the heck it is you guys are saying. Hearing everyone mispronounce this very common Yiddish insult is driving me insane. Is it a network conspiracy? Like the new show “—- My Dad Says” based on the Twitter account, where they have replaced the very common curse word with hash marks. Is “schmuck” such a bad word that everyone has agreed to say it wrong? That’s even more ridiculous than the plot of the movie! And it makes me want to go see it even more.